When your vehicle has broken down or you require the same-day help of a tow truck, Andersons Towing is your sure bet. Our well-trained drivers are on call 24 hours a day to assist you when you need it most. We have several tow trucks and one service truck at our disposal, which enables us to always have a free truck ready to assist you no matter the time of day or night, nor your vehicle's size. 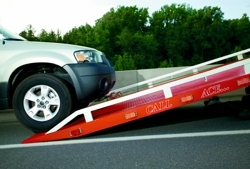 If that were not enough, we also provide dependable roadside services for mishaps like a flat tire or a dead battery. With 34 years of experience behind us, we can provide you with fast and accurate ETA (estimated time of arrival) at competitive prices. The quality of our services is attested by the more than 90 accounts for which we currently tow, most of them having been with us since the beginning. An attachment for towing 5th wheel travel trailers. Specialty damage-free motorcycle towing equipment. Block and tackle for manipulating vehicles on the bed of a truck. Equipment to move a locked up vehicle without causing damage. Straps for towing high line automobiles without damage. For more information or immediate assistance, call us at (209) 566-0206.